Eastwood Professional Abrasive Blaster handles your heaviest-duty rust and paint removal projects, day in and day out. Just hook this 110-lb.-capacity pressure abrasive blaster to your air compressor, put on the appropriate hood and respiratory protection, fill with blasting media and you're ready to blast away rust and old paint. Built for the professional body shop, with a strong welded hopper, 2 heavy-duty nozzles, heavy-wall blast hose and safety pressure-relief valve, so it's rugged, durable, and very efficient for everyday use. Don't skimp with one of those low-cost units that frustrate you with clogging and sporadic media spraying. This Eastwood pro pressure blaster completely strips the average frame in less than a day, rather than weeks using other units or methods. Designed for high flow with minimal air input; a compressor producing a minimum of 10 cfm at 90 psi will work well. 22" x12" x 32" tall overall. 2-year limited warranty. This Pressure Blaster is ideal for cleaning larger parts that do not easily fit into a blast cabinet. The 90-psi pressure behind the abrasive, combined with the siphoning action at the bottom of the tank, delivers an aggressive blast that quickly removes paint and rust. Pressure blasters are many times faster to use than siphon blasters. To minimize the likelihood of distorting sheet metal, reduce pressure to 80 psi, increase gun distance at 45 degrees to the surface. Be sure to wear all appropriate safety equipment. 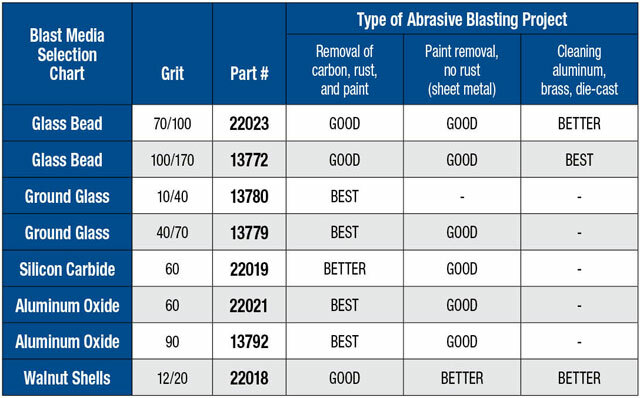 Use with 80 grit or finer blast media. Use of Walnut shell media is not recommended.